This page is designed to provide guests, family members, and visitors who will be joining us for Class Day and Commencement Day with information to assist you with your visit to Harvard Law School. Each degree candidate receives 2 tickets for the morning ceremony. The degree candidate does not need a ticket, their ticket is their HUID displayed in their lanyard. Unfortunately, additional tickets for the University Ceremony are not available. Alumni may request a ticket on a first-come, first-served basis through the Harvard Alumni Association, or by phone at 617-496-7001. Standard (Chicken), Kosher, and Vegetarian/Vegan lunches are available and must be reserved in advance to ensure availability. Requests for special lunches for those with dietary restrictions must be made at the time lunch tickets are ordered. Attendees with serious dietary restrictions are welcome to bring their own lunch. Guests with tickets who are planning to attend the Harvard University Morning and Afternoon Exercises on Commencement Day are strongly discouraged from bringing bags to the events, as all items will be searched. Please let Commencement Staff located at the Information Booth know immediately if you have any security concerns. Guests are encouraged to review the weather reports for Cambridge, MA 02138. Because New England weather can be quite unpredictable, reviewing the forecasts can help guests when they are planning their attire for attending the Commencement activities. Guests often choose to wear “business casual” clothing to the various activities on both Class Day and Commencement Day. All events take place outdoors unless the weather is severe. Most seating for events is on grassy areas and guests should consider this when choosing clothing, outerwear and footwear. Please note that there will also be indoor locations at Harvard Law School where the ceremonies can be viewed live. These spaces are open to guests who want to view the various ceremonies from indoors. On both Class Day and Commencement Day the Dean of Students Office Staff and Commencement Staff will be stationed at the HLS Information Booth, a tent located conveniently outside of the Caspersen Student Center, in between Holmes Field and Jarvis Field. A determination to move to the Severe Weather Plan will be made as early as possible on Commencement Day. If the Severe Weather Plan is in effect, you will be notified by signs posted around the Law School campus and at the Information Booth. Commencement staff will be around the campus to disseminate information. The Law School Diploma Ceremony will take place on the 2nd Floor of Wasserstein Hall in Milstein East in the event of severe weather on Commencement Day. Parking during Commencement Week is extremely limited, so guests are encouraged to use public transportation or taxi services. 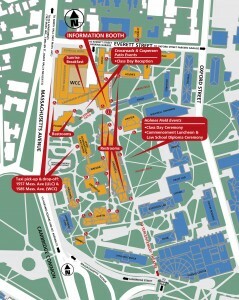 Questions about parking should be directed to the University Parking Office at 617-495-3772 or parking@harvard.edu. Guests in need of transportation may call in advance to arrange a taxi. If you are planning your travel times, note that traffic around Harvard Square will be quite congested. The Class Day reception should end by 5:00 p.m., the Commencement Day ceremony should end by 2:00 p.m., and the University Afternoon Exercises should end by 4:00 p.m. A taxi can meet you in front of Wasserstein Hall (1585 Massachusetts Avenue), or in front of the Lewis International Law Center (1557 Massachusetts Avenue). In addition, there is a taxi stand and an MBTA “T” Station (subway Red Line) in Harvard Square, directly across the street from Harvard Yard. Use the MBTA Trip Planner to determine public transportation options from your hotel to Harvard Yard. We’ve compiled a list of hotels in the Boston / Cambridge area, but keep in mind that it is not an exhaustive list, and it includes many of the biggest hotels. You may be able to find other B&Bs or smaller hotels not listed. Many hotels have AAA discounts, and some hotels may have graduation discounts or rates negotiated by Harvard. Check with the hotel before you book your stay. Commencement Flowers will be selling bouquets on the Harvard Law School campus during the Commencement ceremony. 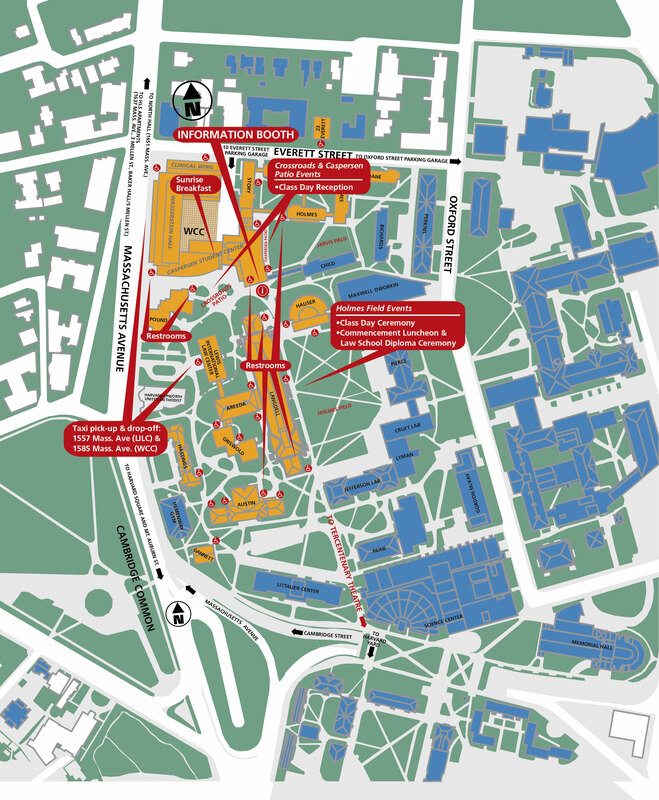 They will be located on the lawn in front of Austin Hall between Holmes Field and the Harvard Science Center, and near the Information Booth outside of the Caspersen Student Center. You may pre-order flowers through Commencement Flowers. The Harvard University Commencement Exercises and the Law School Ceremony are televised and captioned live in several Law School venues: the two large screens facing the audience on Holmes Field, Wasserstein Classrooms 1010, 1015, 1019, as well as The Pub and Harkness Commons South. In addition, the University ceremonies will be shown on local cable television (Comcast) Channel 283. The Law School Class Day and Diploma Ceremonies will be live streamed on Wednesday, May 29 and Thursday, May 30. A current Flash player is required to view the broadcasts.